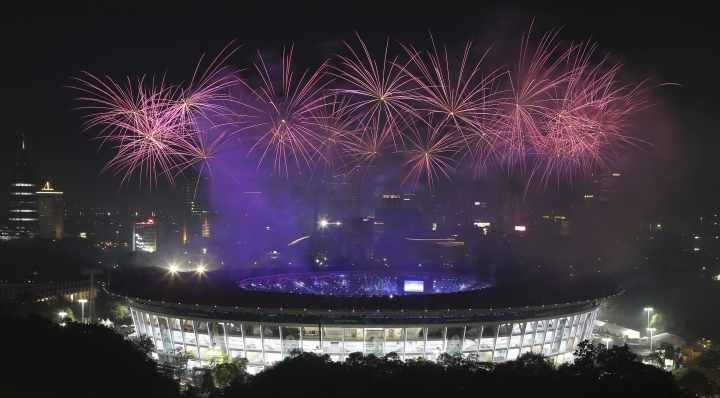 JAKARTA, Indonesia — Indonesia's hosting of the Asian Games and a record haul of gold medals have swelled national pride, boosting the re-election campaign of President Joko "Jokowi" Widodo. But for Indonesia, which has won only seven Olympic gold medals — all in badminton — it was a landmark haul that outdid its modest ambition of sneaking into the top 10. A well-received opening ceremony, an absence of major organizational problems and Jokowi's surprise announcement Saturday that Indonesia would bid for the 2032 Olympics have fueled feel-good nationalism that analysts say is likely to lift Jokowi in voters' sentiments heading to an April election. That would widen his already substantial lead over former general and ultranationalist politician Prabowo Subianto, Jokowi's challenger for a second time. 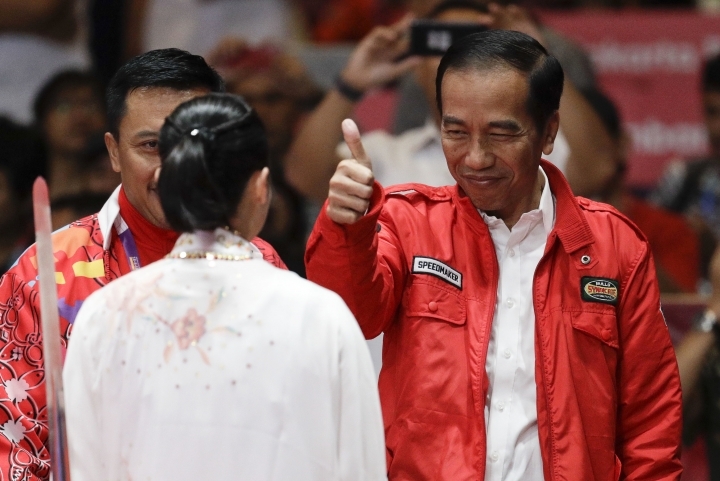 The games will "certainly have a positive impact on Jokowi's electability," said Syamsuddin Haris, a political analyst from the Indonesian Institute of Sciences. 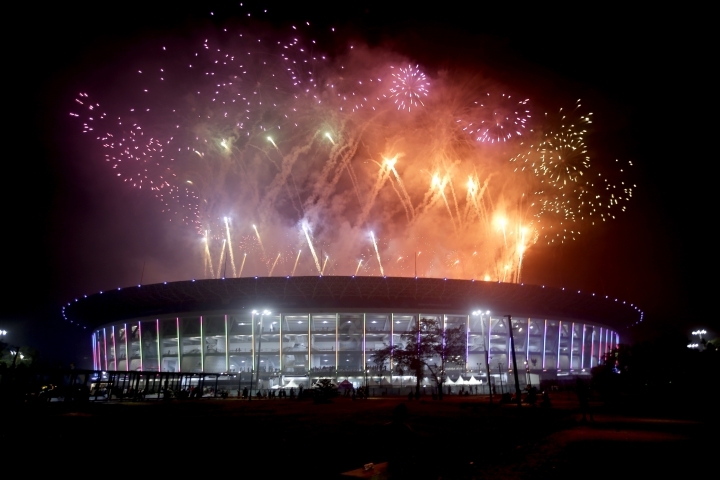 "The spectacular opening ceremony became a successful campaign for the incumbent, especially to attract swing voters and millennials whose numbers are very significant." Jokowi was compared to Barack Obama when first elected in 2014, and he and his advisers have cultivated a "cool cred" around his presidency. That was evident two weeks ago in his cameo at the opening ceremony before a crowd of 40,000 and a national television audience. A slickly choreographed video showed Jokowi stuck in traffic — a humorous nod to one of Jakarta's major challenges in hosting the games. He donned a black helmet and raced through the city's backstreets on a motorbike to reach the stadium on time. Then the motorbike shown in the video sped into the stadium and its helmeted driver disappeared into a tunnel moments before the real Jokowi appeared in the VIP area to thunderous applause. It resembled part of the opening of the 2012 London Olympics, where Queen Elizabeth II and James Bond appeared to skydive into the stadium. 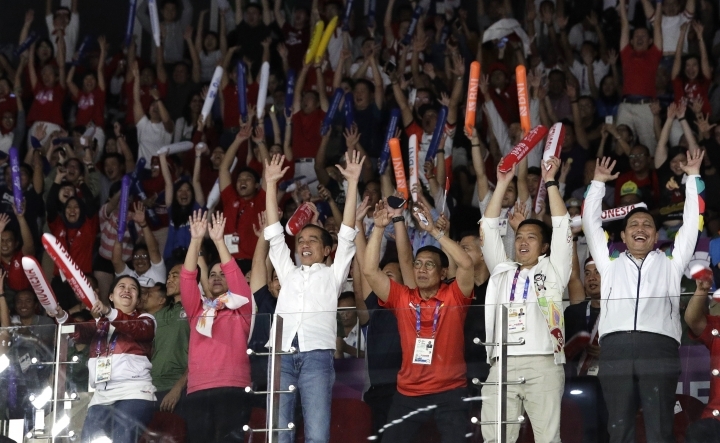 In another moment that riveted Indonesians, Jokowi was shown enthusiastically grooving to music blasting across the stadium, a stark contrast to the morbid formality of most Southeast Asian leaders. Haris said the games also positively highlighted ethnic and religious differences in Indonesia, the world's most populous Muslim-majority nation, with more than 260 million people, making it harder to exploit those divisions during the election campaign, he said. "The Indonesian people saw how the athletes are fighting for victory, for gold medals, and the winners are not only Muslim, but also of Chinese descent, Christian, Hindu and Buddhist," Haris said. "This will certainly dampen the sectarian and ethnic issues used in the 2014 presidential elections." Despite Jokowi's prominence, Subianto wasn't totally deprived of oxygen. As chairman of the Pencak Silat association — a local martial art included in these games — he was shown on national television presenting some of the 14 gold medals that Indonesia won in the discipline, and in a group hug with Jokowi and one of the winners. But he was also mocked online with a mercilessly effective meme that juxtaposed a recent image of a shirtless and flabby Subianto against the washboard abs of an Indonesian heartthrob who jubilantly tore off his shirt after winning gold in the men's badminton singles. Young Indonesians make up 35-40 percent of voters and will play a "decisive" role in the 2019 presidential race, said Hugo Brennan, Asia analyst at Verisk Maplecroft, a business and political risk consultancy. "Jokowi's motorcycle stunt during the opening ceremony was widely shared on social media and will have burnished his 'cool credentials' among this important constituency," he said. The PR win comes less than a month after Jokowi unexpectedly chose a conservative cleric, Ma'ruf Amin, as his running mate, dismaying moderate and liberal supporters but likely neutralizing damaging criticism that he isn't sufficiently Islamic. 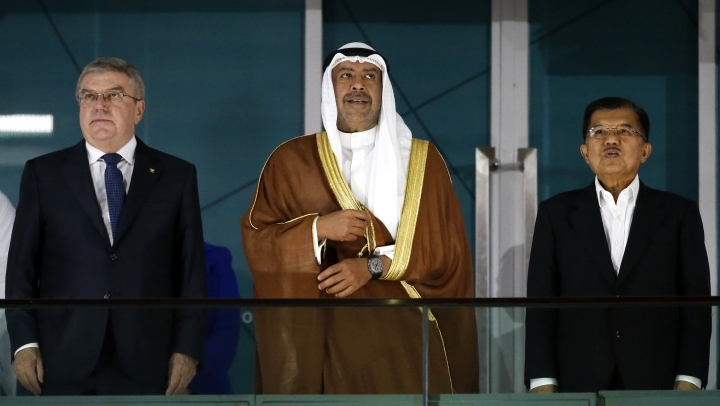 Most of his five-year term has been spent balancing the demands of his moderate base, powerful Islamic conservatives, a complicated parliamentary coalition and the military, which has never completely accepted its diminished role following the end of the Suharto dictatorship two decades ago. 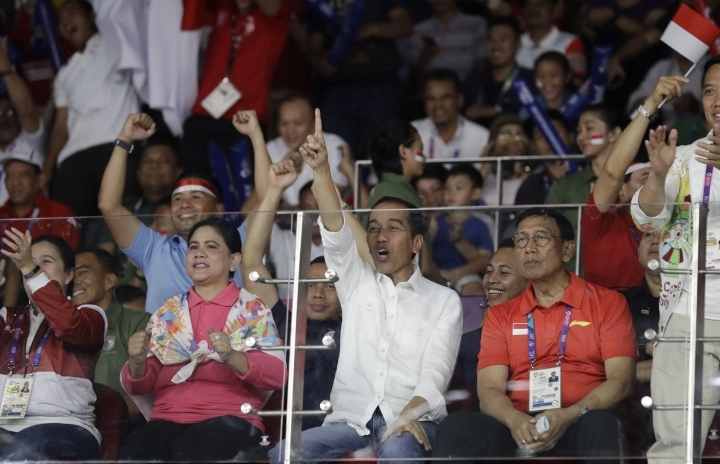 Improving Indonesia's creaking infrastructure has been Jokowi's signature policy — the Asian Games indirectly highlighted some of the progress — and he enters the campaign the clear but not unbeatable front-runner. If it's any consolation for Prabowo, who was narrowly defeated by Jokowi in 2014, the games afterglow will fade and is unlikely to be a decisive factor when the world's third largest democracy votes in April, analysts said. 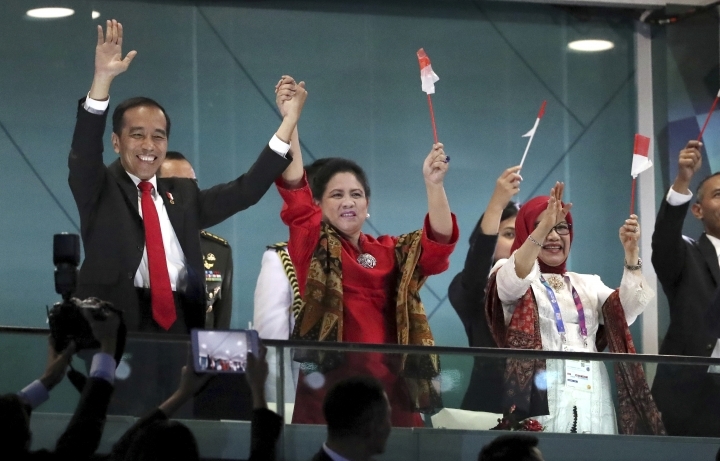 "I think Jokowi's and Indonesia's performance in the Asian Games will give the president a bit of a bump in the polls but I'm not sure it significantly changes his odds of re-election," said Eurasia Group analyst Peter Mumford. 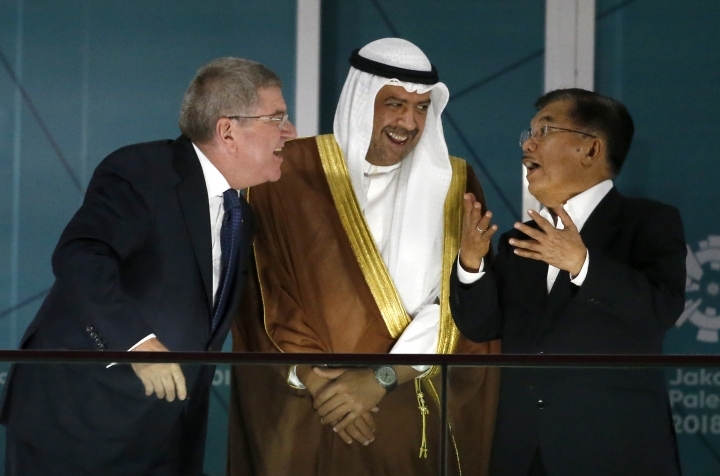 "Any benefit from the Asian Games may have dissipated by then. But certainly doesn't do him any harm," he said. 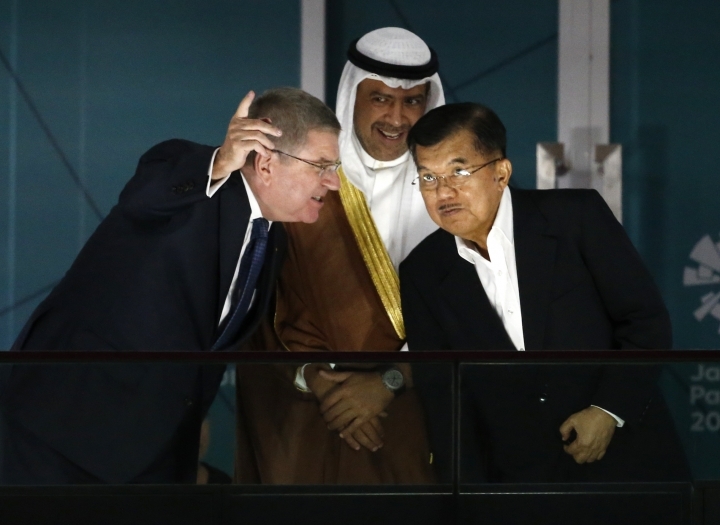 Jokowi, however, appears intent on extending its shelf life, announcing alongside the president of the International Olympic Committee on Saturday that because of the success of the Asian Games, Indonesia will bid for the 2032 Olympics.